Your veterinarian has determined that a blood transfusion is needed. 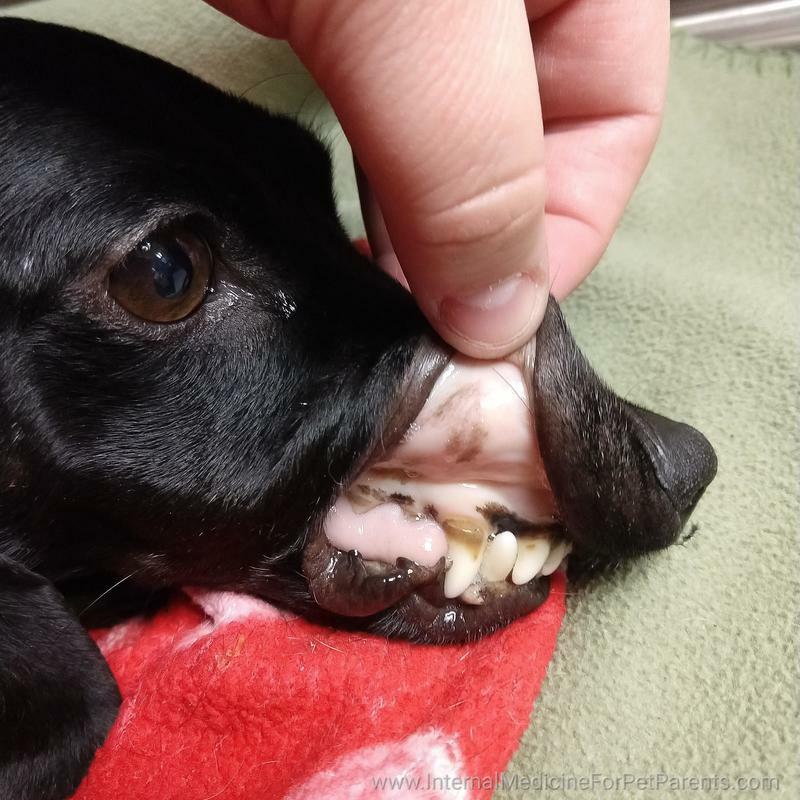 Depending on the reason for the pets need, the veterinarian will determine if the transfusion will be of packed red blood cells (pRBC's), whole blood, or plasma. If your pet has an auto-immune disease like IMHA, the first thing to know is a blood transfusion is not a cure and will not keep the body from attacking the new blood cells. A patient with any auto-immune disease already has an immune system over-reacting so it is important not introduce more stimulating substances, like blood that doesn't match. Red blood cells live for about 3 months after being made. Depending on the age of the blood being transfused, and for an IMHA patient how well the immune system is being suppressed, will determine how long the transfused blood survive in the pet. In IMHA or Evans patients it can be common for several transfusions to occur before the medications kick in and the body stops attacking the cells. Remember meds can take 2-5 days to start working fully. The transfusions are band-aids until that happens. A cross-match should be done before any transfusions. The only time it is considered acceptable to not perform a cross-match is when a patient is actively bleeding out and they have never had a transfusion before. This is rare, but can happen in trauma cases or bleeding masses. A cross-match compares the donors blood to the recipients blood to make sure they will not react to each other and make things worse. A transfusion reaction can be fatal if it is severe enough. 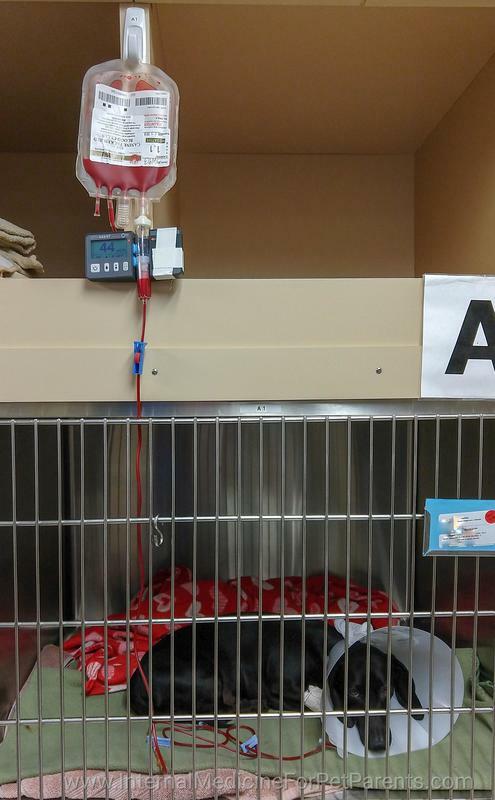 ​Packed red blood cells (pRBC's) are the preferred transfusion for a pet that has normal blood volume but is anemic. If your clinic only has whole blood that works too. The transfusion is usually given over 2-4 hours with close monitoring by technicians for any possible transfusion reactions. Dash is a dachshund, newly diagnosed with IMHA, and he came into the vet for being very lethargic, not really wanting to stand, and not eating. His gum and tongue color was very pale, and his PCV was 15% when he was admitted. 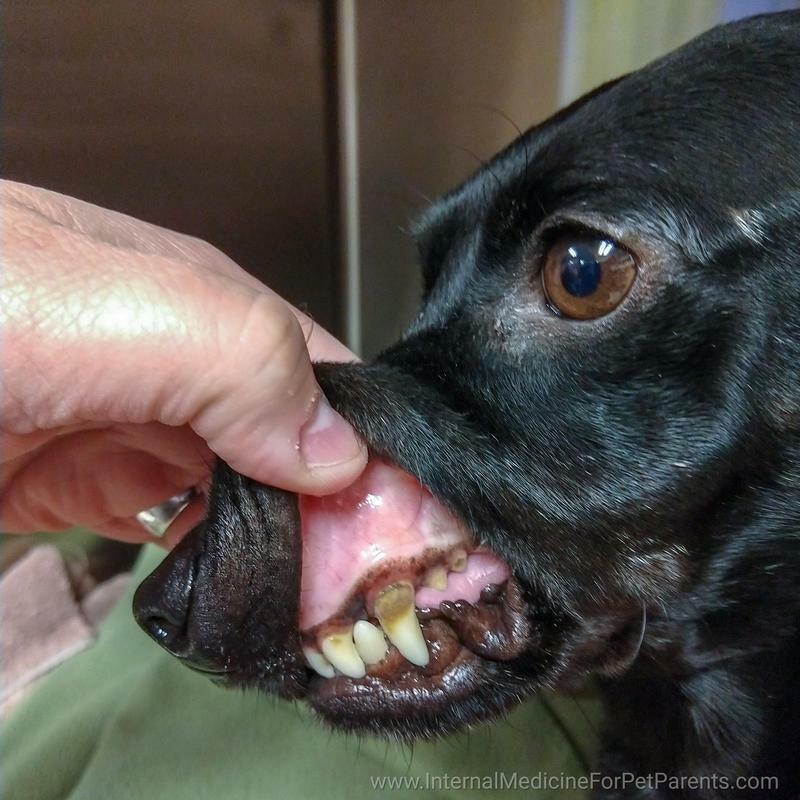 He received a single unit of packed red blood cells and after the transfusion his gums were much pinker, his PCV was 25% (not normal, but much better), and he was standing in his cage, happy, and hungrily ate a bowl of wet food. The best way to know for sure is to perform an arterial blood gas analysis. It requires a blood draw from an artery. This analyzes the blood directly for how much oxygen is attached to the red blood cells in circulation and also carbon dioxide. A plasma transfusion is for a pet that does not need red blood cells, but may need more proteins, especially albumin, or they need a colloid. Let's discuss the two types of fluids: crystalloids and colloids. A crystalloid fluid is a fluid with smaller molecules that can easily pass across the cell membrane of blood vessels to help rehydrate the body. These fluids can be given intravenously or subcutaneously (under the skin). This is the most common fluid used in veterinary medicine. Examples of this is Lactated Ringers Solution (LRS), normasol, and 0.9% saline. A colloid is a fluid that has large molecules that do not leak out of the blood vessels. These fluids are used when the patient has enough fluid in the body, but has low blood volume causing low blood pressure. Colloids help increase the blood pressure for a longer period of time than crystalloids do, since they are structurally too large to quickly 'leak' out of blood vessels. Examples of colloids are plasma, albumin, and hetastarch. Plasma is a great colloid and can be used for animals with low total proteins or coagulopathies such as rodenticide toxicity, rattlesnake envenomation, or heat stroke patients. A cross match is not required, but blood typing is suggested if the clinic uses different blood types for their blood products. The biggest risk of transfusion are transfusion reactions. These can happen immediately after starting a transfusion, all the way up to a three weeks after transfusion, although that is rare. An immediate transfusion reaction is essentially an anaphylactic (allergic) reaction to a component in the blood. This includes vomiting, diarrhea, elevated body temperature, increased respiratory rate, decreased mentation, shock, or even death. Cats are especially prone to these type of reactions if given the wrong blood type, so it is critical for a cat to be blood typed and cross-matched before any transfusions. Reactions occurring within the first 48 hours are the most common reactions seen. A delayed transfusion reaction can occur anywhere from 3-21 days after a transfusion is administered. These patients can have hemolysis, destruction/breakdown of red blood cells, and lethargy. In patients with immune mediated blood disorders it can be increasingly difficult to know if this is a transfusion reaction or incomplete suppression of the disease. Again, these reactions are rare, but can happen, so it is important to be aware of them. Patients that have more than one transfusion increase the chance of having a reaction, as they start producing antibodies against the foreign blood within 3-7 days. It is essential to ALWAYS cross-match with any transfusion. Just because they didn't react previously do NOT mean they will not react to any other transfusion, especially blood from the same donor. It is important to remember that a blood transfusion is not a benign treatment. There are risks with any treatment including using blood products. If you have questions about this, speak with your veterinarian.